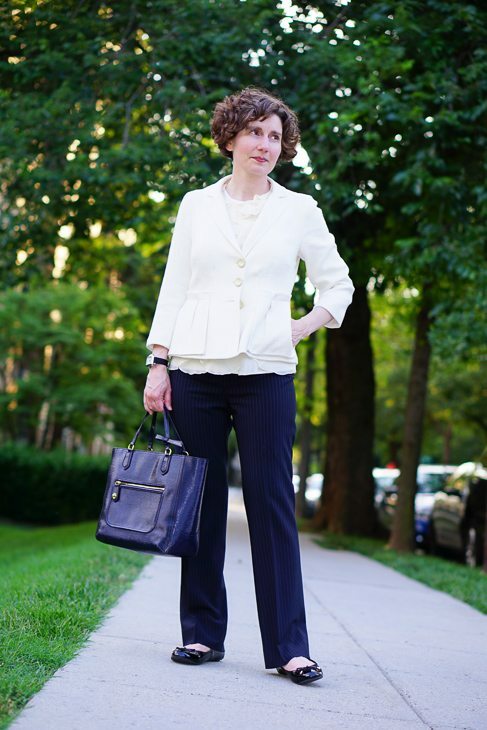 When the temperature rises, dress code standards tend to fall — but some days one still has to look like a lawyer to attend a mediation or hearing. Under those circumstances I put on the summer edition of The Black Suit. I bought this Nanette Lepore jacket a couple of years ago and it is perfect in hot weather. The fabric is a blend of linen and viscose and is highly breathable. 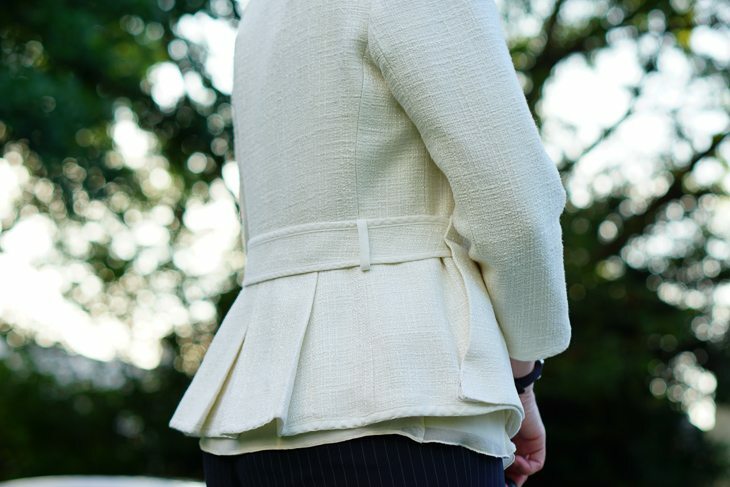 The jacket is so beautifully constructed that it has an almost architectural presence, even though the fabric is quite supple. 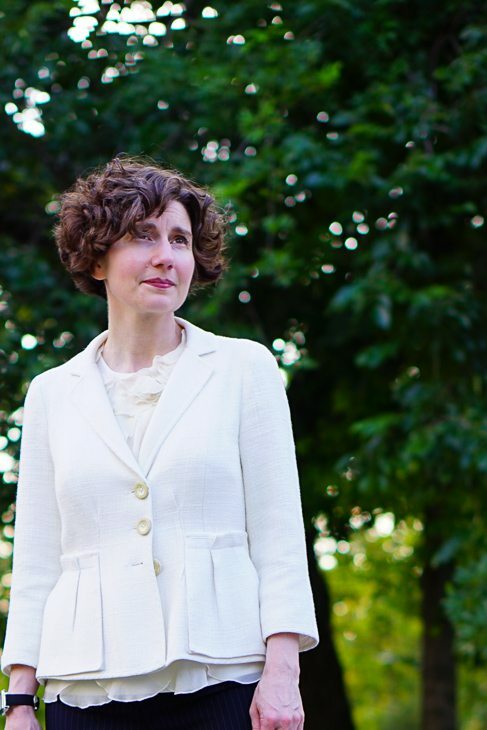 Ivory is serious, almost ceremonial, in the summer in a way that white isn’t. Perhaps that is a function of fabric rather than color. 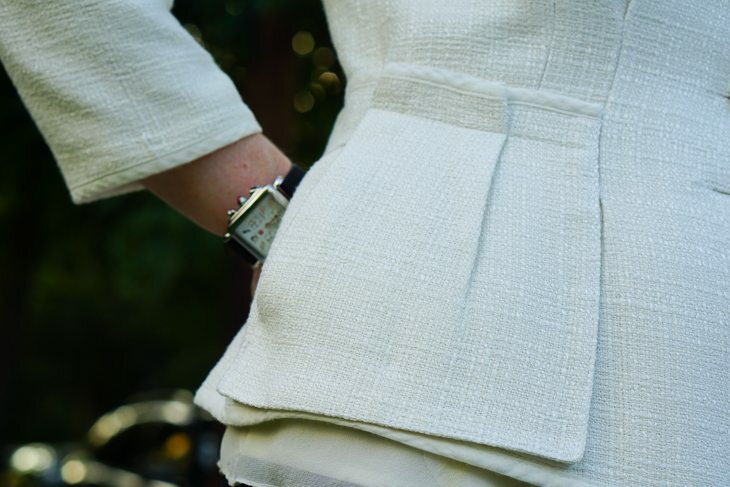 The truly bright whites are generally cotton and linen, which are more informal than tropical wool, silk, or chiffon. So while navy and white make a smart summer combination, they don’t have the gravitas of ivory and navy or ivory and black. 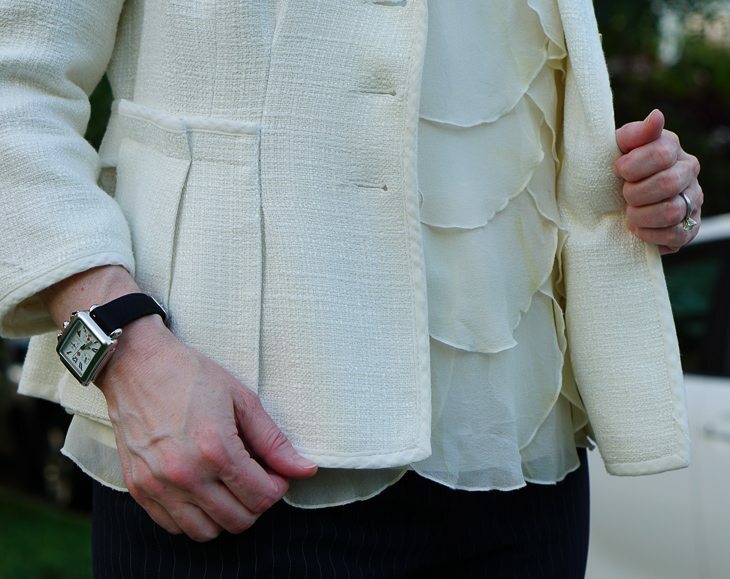 I like an ivory blouse under an ivory jacket. A navy blouse would also work, as would a printed blouse, but I like the simplicity of tone-on-tone. 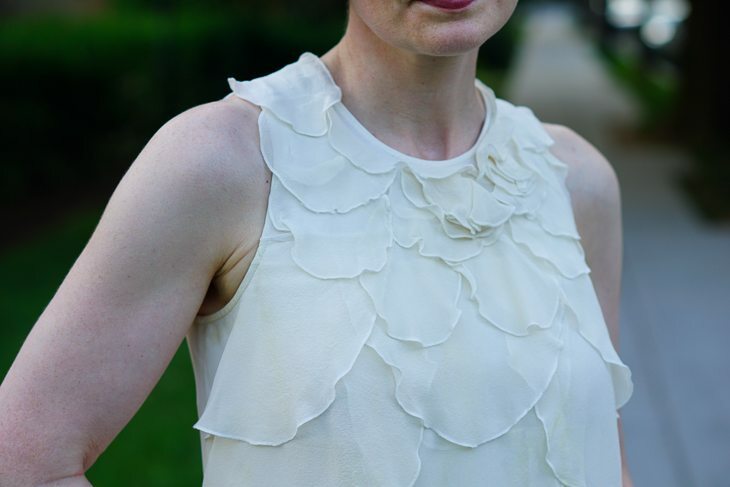 The blouse has detail of its own that keeps it from looking flat. Silk chiffon is very light, visually and physically. 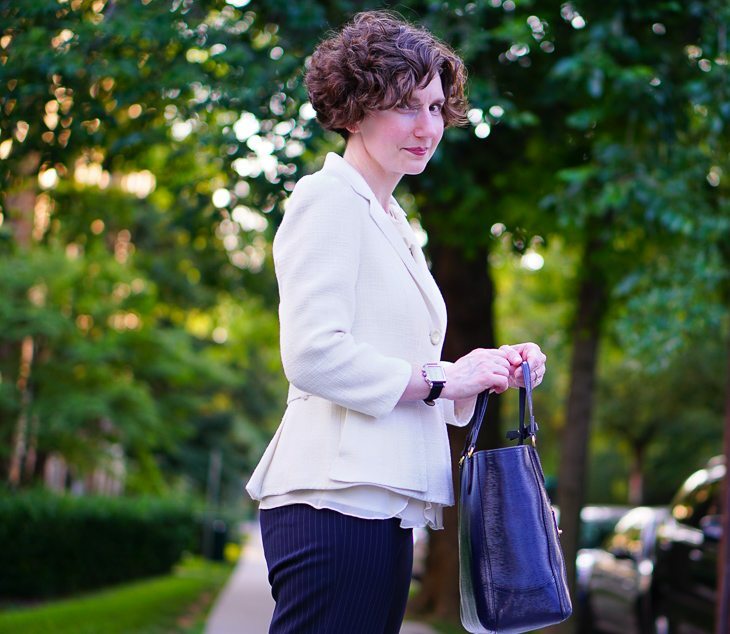 Navy pinstripe pants (pinstripe is very subtle), black patent leather flats and a navy patent leather bag complete the look. If I had a pair of navy flats, I might wear them with this outfit, but I don’t think so. A little black prevents this from looking contrived. 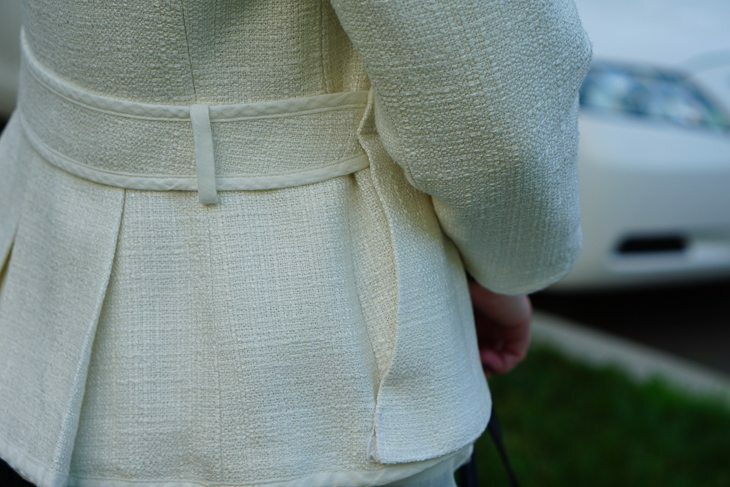 Now back to the jacket and the dressmaker details that give the jacket such presence! 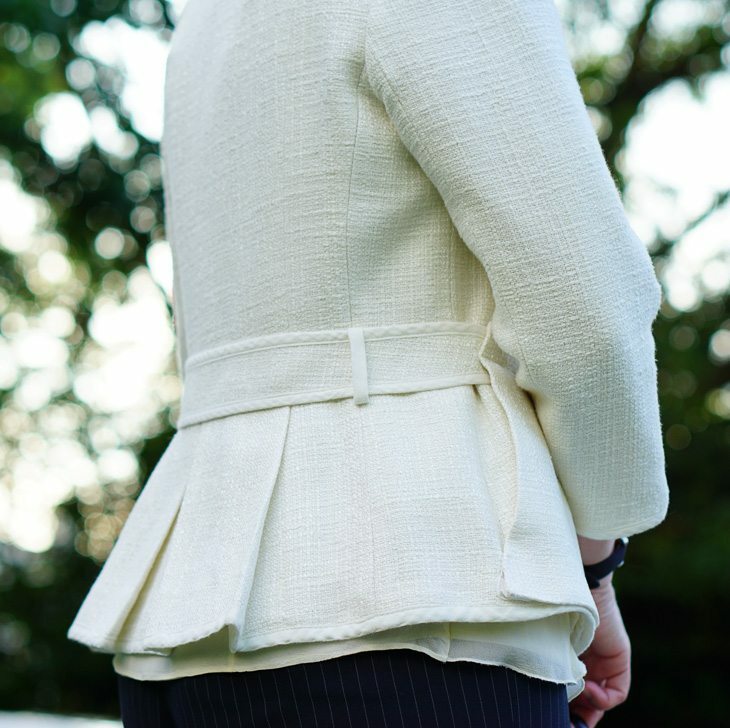 Pockets are tacked down to create a bellowed (one bellow) effect; is there a singular form of bellows? I love all little details on your jacket. It is beautifully constructed and feels light ,too. No one needs to feel constricted in the summer. I think the jacket is adorable and the whole outfit is perfect. Oh so lovely. I agree that ivory is much more polished that white. This is just perfect outfit. Jacket is so cool.